The magic of a holiday spent in Pantelleria lies in the beautiful mix between nature and architecture built by man: the terraces of cultivated fields with capers and grapes surrounded by drystone walls that design a fascinating path through the island, reaching the dammuso, the typical house of Pantelleria. All these fuse in the dammuso Magia Mediterranea: a recently built dammuso, made up of local materials such as volcanic stones and that combines nature with the surrounding landscape. Located in Contrada Penna, in the south west of the island, just near Scauri, the dammuso is immersed into a Mediterrean garden of two acres where you can abandon your senses to the perfume of aromatic plants, the beauty of fruit, capers and olive trees, and the colour of the bougainville. The dammuso Magia Mediterranea is a building of 300sq. meters where you can find six spacious rooms, each one with ensuite bathroom, air conditioning and tv. All the finishings are of excellent taste and really painstaking job, mixing modern and elegant solutions such as the colourful resins and the ecologic paint, contemporary and country furniture mixed together and objects inspired by nature. A unique style, suspended between the Mediterrean atmosphere and cosmopolitan splendour thanks to the objects selected with great taste all around the world. The external area has a chill out zone with sofas and arm chairs, a covered terrace with an external kitchen with wooden oven, perfect for lunches and dinners overlooking the sea, and one last treat: a beautiful 70 sq. 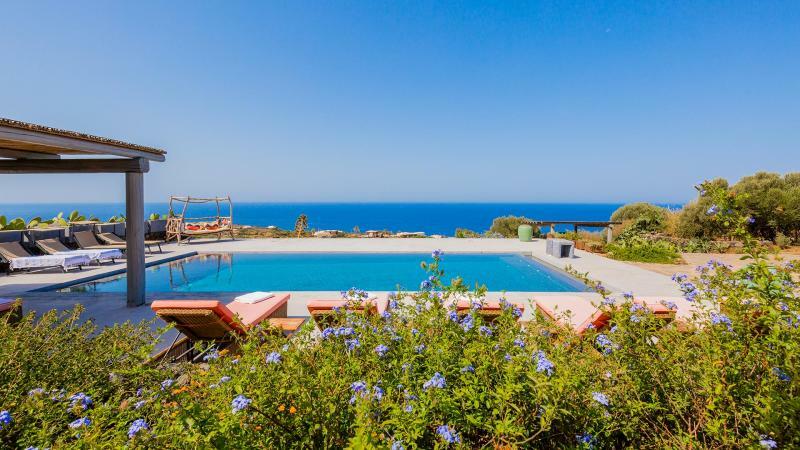 meters swimming pool, for where you might watch the heated sunsets of Pantelleria. The dammuso Magia Mediterranea is located in Contrada Penna, in the hills just above Scauri. It`s very easy from here to reach town to make some shopping, having dinner or renting a boat; it´s also very easy to access some of the best spots in Pantelleria such as Niká and the Sataria caves or hike in the Montagna Grande reserve.